You might be renting a basement and thinking that you are not a part of the Toronto condo boom but yet you are - as you are subsidizing it. Each time a condo tower is built, each unit must pay a developing charge. 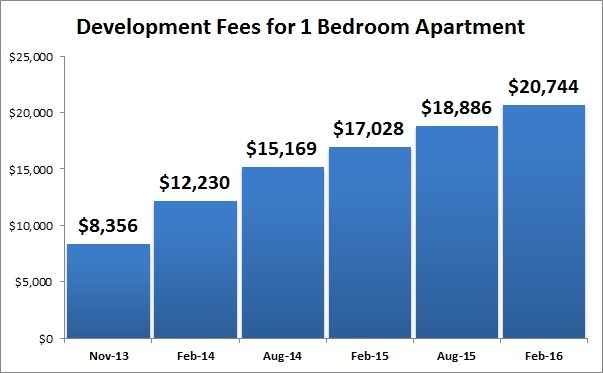 In November 2013 the fee was $8,356 for a one bedroom apartment. The principle behind development charges is that "growth pays for growth" - so that the cost of growth-related infrastructure does not fall on the existing community in the form of higher property taxation or user fees. Development charges help ensure that municipalities have adequate funding to invest in necessary capital improvements in a timely manner so that average service levels do not decline as a result of growth. Development fees are supposed to be set at a level that recovers the costs that new growth generates, but in the City of Toronto that is just not the case. In 2008 a Development Charges Study calculated that in order to fully recover growth related costs, a fee of $10,174 should be applied for a one bedroom apartment - equivalent to a 100% rate hike at the time. However the hike never occurred as the developers community threatened to appeal the matter to the Ontario Municipal Board. Instead, then mayor David Miller negotiated an agreement to freeze the charges for two years before phasing in an increase of 25% per year. Moreover, a 10% discount was given. So instead of rising to $10,174 (for a 1 bedroom apartment), development charges were to rise only up to 90% of the full cost recovery over four years. Including the rate discount and phase-in, the total cost recovery between 2009-2013 averaged only 80%. As a result of the 10% discount and phase-in, city staff estimated based on 2009-2013 building activity that the City of Toronto lost $350 million in foregone development charges revenue. "To the extent that development charges are not fully implemented, a portion of these growth-related costs would need to be funded from other non-development charges sources, such as, for example, property taxes or utility rates." That means that Torontonians had to pay $350 million between 2009 and 2013 in order to continue to receive the same level of service as a result of new developments. Some say that higher development fees in the suburbs are justified as everything has to be built from scratch on the ex-farm fields. Yet, at the same time, Oakville and Oshawa are not building subways which cost billions of dollars. The good news for taxpayers is that the development charges are going up. In fact rates for one bedroom apartments went up about 50% in February 2014. Moreover development fees are set to go up all the way to $20,744 in February 2016. "The development charges background study identifies approximately $3.4 billion in net costs attributable to new development that is forecast to occur within the City over the 10-year study period (2013-2022). "The proposed by-law rates and policies are forecast to generate approximately $220 to $260 million annually, on average, in development charges revenues to help fund the City's growth-related capital investment needs. This represents approximately 70% cost recovery as compared to theoretical full cost recovery under the Development Charges Act"
So over the next decade the total net costs associated with new development are forecasted to be $3.4 billion yet development charges are expected to recover only about $2.4 billion. This leaves the existing tax base responsible for more than $1 billion in costs. Nevertheless development charges for apartments are bound to double during the next two years. 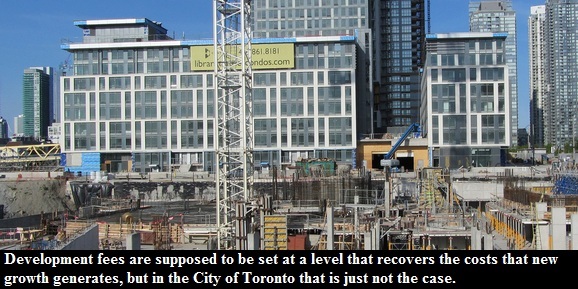 Does that mean that new condos will rise in price as a result? Pre-construction prices have been flat since 2011. With new units costing the same price (if not more) than resale ones, few are willing to pay a premium for something that hasn't been built yet. Chances are that it will be the developers who take a cut to their profit margins as a result of higher development fees.